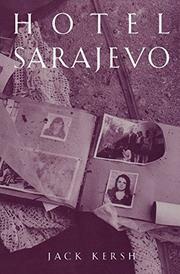  A first-time novelist brings the horrors of war to vivid life in this tale of a young girl's struggle to survive in ravaged Sarajevo. Every day shells rain down on Sarajevo, citizens risk death crossing Sniper's Alley, and the social fabric of the city disintegrates so profoundly that children routinely wander off from their families and entire buildings are taken over by urchins. Such is the case with the Hotel Sarajevo, now commandeered by teenaged Luka (``the king'') who has hand-picked his subjects from the pool of neighborhood orphans and taught them to raid similar bands of children for firewood and food. Alma--a quiet, watchful 13-year- old--plays a peripheral role in this group, dodging the advances of Milorad the ``poet,'' longing for a kiss from Luka, and envying the glory of ``Princess Sandra,'' Luka's companion and a symbol of innocence and beauty for them all. Having lost track of her mother long ago, Alma clings to the hotel residents for protection even as they're killed off, one by one--by the shelling, by snipers, by illness, and finally by a kind of willed suicide. Increasingly desperate to maintain her sense of self, Alma teams up with Omar, a boy she meets while viewing the bodies of a pair of lovers killed in each other's arms. Alma and Omar become lovers themselves and decide to try to flee Sarajevo--only to be caught by the enemy in the frigid mountains that have imprisoned them for so long. Lord of the Flies comes to mind, as does The Diary of Anne Frank. In the end, though, all comparisons fall away as the terrible truth of Kersh's fiction emerges. A haunting, masterful work.